All the Things You Are was written by Jerome Kern and Oscar Hammerstein II for the Broadway musical “Very Warm for Me,” which debuted in 1939. All the Things You Are is one of the most popular standards of all time. The changes are harmonically complex and fun to improvise on. The melody is also genius. Countless jazz musicians have fallen in love with this tune, and it is one of the most recorded standards. If you want more of an in depth analysis and a lesson on how to improvise over All The Things You Are, click here. In this song there's Ebmaj7 I Abmaj7 I A-7b5 D7 I Gmaj7. That's 2 different keys, but what would you call the A-7b5? It's in one bar along with the D7, so is it a pivot chord, or a passing chord? I first heard “All The Things You Are” in the 70’s when I started listening to Jazz by the brass & reed band, Supersax. I fell in love with the song from then on. It had a rich blend of strings that accent it very well. Perhaps some of you remember the recording on “Supersax plays Bird with Strings”. hi, I’m a newbie in jazz, but I’m trying to learn some standards, and I need some help if you don’t mind. In the fifth bar you have IVMaj7 (key center up maj 3rd) right? I understand DbMaj7 is the IV of Ab key, but what do you mean with key center up maj 3rd? Thanks, listening to this pianoless quartet is always a treat. Haven’t heard the rendition in years. Like the way one plays the guide tones when the other solos. or not when using the bass to completely guide them through the maze of wonderful jazz. Thanks Brent (both of you! haha). I have put up the link to Brent’s great video series “Seven Steps to Heaven.” It’s definitely worth checking out! 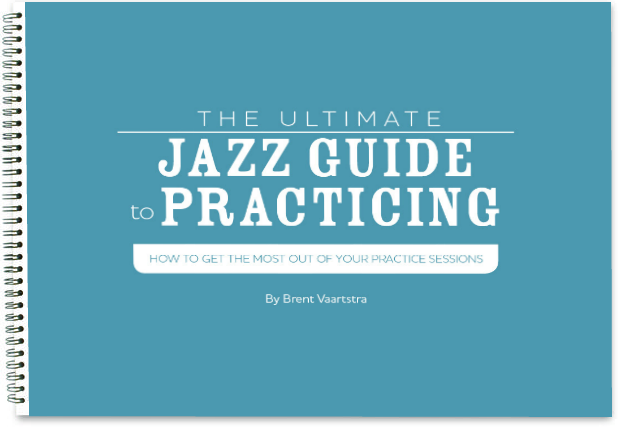 Brent worked hard on it, and it’s an incredible way to improve your improvising and learn tunes inside and out! The Desmond/Mulligan recording is the one I use in the video demonstrations for the “Seven Steps to Heaven” handout. Great classic tune! Already knew this tune, but I really enjoyed how you provide a Roman Numerals chart, and not only that an explanation of what the chord changes are doing. I feel like there is a lot to be learned from this process. Also loved how the origin of the piece was included, something every serious jazz musician should know! Great post!